Dr. Lawson grew up in Charleston, West Virginia and graduated from West Virginia University. She enjoys skiing, reading, watching HGTV and travelling. She loves cheering on the Titans and the Predators. Her sons, Wade and Luke, are in middle school and keep her busy with all their activities. Her husband, who she met during residency program, is from middle Tennessee and practices Pulmonary/Critical Care Medicine at Vanderbilt and the Nashville VA.
She enjoys caring for women of all ages with benign breast conditions. She has a special interest in working with our multi-disciplinary team to individualize each patient’s cancer journey to maximize not only survival, but the cosmetic result as well. 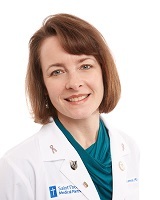 Dr. Lawson is the medical director of the Saint Thomas Health Breast Cancer Program, the medical director of the Multi-Disciplinary Breast Tumor Conference and the director of Tennessee Breast Specialists. She participates in many Baptist Hospital advisory committees and is active in Tennessee Women in Medicine. She enjoys helping with various breast cancer awareness activities in the community and has been sel[MSF]ected as one of Nashville's "Healthcare Heroes" and "Women to Watch."